It’s very interesting to me to think about how to write “About Me” because there is so much about me to know. I am happy to give you all the flair and flourish of me, but I’m a work in progress. I am 40, a Virgo with hazel eyes and auburn hair with purple highlights. I like long walks on the beach, roses, gardening and… lol! Really, I am a passionate person with an intense love of life. I can’t get enough of the people I cherish. I express my creativity in probably too many ways and I am up for trying most anything at least once. I am mom to 2 great young men. They challenge me, amaze me and inspire me. They also drive me to drink from time to time (though you should know that I am a one glass wonder!) But these are the people who will dance with me in the kitchen anytime and the ones who know how to have fun McGuyver style with a cardboard tube, some bubble gum and a shoe lace. They make me laugh, make me cry, make my heart swell and make it break. Without their divine existence I would be less than I am today. I am wife to a stallion of a man. He is my champion and my best friend. We were high school sweethearts and married in our early twenties. We’ve grown up together and there is no one that I am prouder of in the world. We’ve learned that honest communication is pivotal in our relationship. That, and laughter. I married a funny man… but he probably doesn’t want you to know that. He’s British and his game face is a reserved one. I am daughter to a talented old lady and the sweetest blue eyed man. My dad died 9 years ago, but one of my greatest joys is that he knew my children. My little guy was a few months old when my dad passed, but he held him and loved him and along with the memories my oldest has of rocking in the “comfy chair” with pa, my heart is warm. Now, my mom is a retired teacher. And while she is many things, she is a truly gifted wood carver. I like seeing her manifest her passion. It’s inspiring. 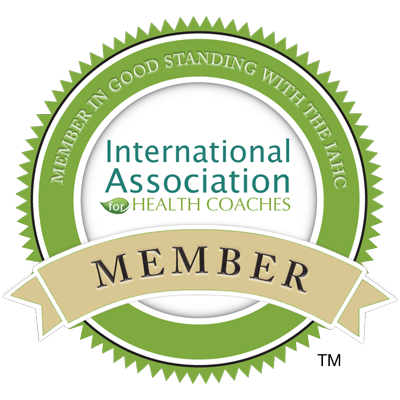 I am a Certified Holistic Health Coach and I am passionate about health, both my own and yours. I think that everyone can achieve balanced health. I am also passionate about clean green living. I enjoy supporting local farms, local merchants and artisans. I don’t use commercial cleaners in my home and I aim to bring in as close to all organic foods for my family as possible. I am an exerciser, but not an athlete. I love spending time outside and love to garden. I usually have dirt or dough under my fingernails and I’m okay with that. I am an artist and I love stylized lettering and calligraphy as well as painting, sketching and working with recycled materials in multi-media. I am an advocate for my friends and for faith, peace and justice. I love to research. Anything. I am an info junkie. I also love to write and I will write more again, but duty calls and I have to get back to playing with a certain 6 year old! In 1991, I was diagnosed with an advanced Thyroid cancer, had my thyroid removed and was subjected to rounds of RadioActive Iodine among other therapies. The following 10 years were fairly steady, but I didn’t get my first clear scan until 2001. 2002 saw the birth of our first child. My health got rocky, but I was blessed with a 2nd child in 2006. It was then that I was diagnosed with Psoriasis and Psoriatic Arthritis. It’s been a long road of traditional medical therapy and alternative therapies… a lot of research and a lot of trial and error. I think pain is a powerful motivator, as is love. The depth of the pain I suffered and the depth of the love I have for my family drew me to seek traditional medical care to get through the acute phase of my illness. But when I got to the point where the medication was making me sicker than the disease I knew that things had to change. I feel blessed to have found Dr. Joel Fuhrman at a point where I was on the verge of starting a biologic drug… his plan for my health turned things completely around and showed me that even my body could heal and regain balance. I’ve made drastic changes in my life these last 24 years and I am at a place where I am no longer taking ANY medication to manage my disease. That alone speaks VOLUMES when you consider the quantity and variety of drugs I was prescribed to “manage” my pain and inflammation. In any case, a lot of people ask me about my experience with nutrient dense eating, alternative modalities and what I eat on a daily basis. It’s really simple… I eat mostly greens. Greens and veg are the focus of every meal, for sure! I usually start the day with a green smoothie and then have salad for lunch and dinner. I top my salad with fresh veg, cooked veg and sometimes beans and lentils. I also enjoy soups because they are flavorful, quick to make and easy to pack with veg. It’s also nice to have something warm during the cold winter months. *The fish oil is the only animal product that I use in my diet. Unfortunately, I have not found a vegan formula that works for me. I am always open to recommendations. *My caffeine confession: I definitely drink coffee — I can’t lie. But, I don’t drink nearly as much as I used to and I cut it out completely if my arthritis flairs. It’s my vice. Oh wow. I clicked on your blog (from my tag surfer) and thought it was taking me back to my blog. Our these is so similar. Sorry, that was meant to read themes are so similar. Excellent! Glad you stumbled on my blog! Funny how things happen, isn’t it? Hey, I had a peek at your blog… I love how you’re chronicling your year. And the year is going so quickly.